The cardinal, the black bear and the rhododendron are all symbols associated with the Mountain State, but as is the case with any expression as firmly connected with an entity as these are with West Virginia, their meanings and origins have perhaps been swallowed by their familiarity. But given some closer inspection, their histories may prove illuminating and curious. The Legislature ultimately sings the tune in the adoption of trees, birds, animals and colors that have become the symbols of West Virginia. On the other hand, the people of West Virginia make the initial push for the consideration of these symbols as official state emblems. Usually, citizens, organizations or schoolchildren, after researching particular symbols that they think are appropriate to represent their fine state, make a request for a resolution to be introduced. Once the residents show an interest in a new state emblem or symbol, polls of various groups are usually conducted, and the resolution is introduced with the recommendation from the poll. Of course, some of West Virginia’s symbols are well-known throughout the state, but others are recent additions, not widely known, while others still may be downright obscure. The state flower, the rhododendron, is our state’s oldest symbol. Actually a flowering shrub, it is most commonly seen with purple, pink and white blooms in the latter part of spring. The flower (also known as big or great laurel) was selected on January 23, 1903, by a joint resolution from both houses. The resolution was approved after the rhododendron beat the honeysuckle and wild rose by more than 15,000 votes in a poll of public schoolchildren from across the state. Following the same process, college students, garden clubs, civic organizations, sportsmen clubs and bird study groups helped to officially name the sugar maple as the state tree and the cardinal as the state bird. The cardinal has been the state bird since a concurrent resolution was passed during the 1949 legislative session, after animal enthusiasts expressed an increased interest in state wildlife. The scarlet red male of this species is easily recognizable with its black eye mask and yellow beak with the females and young birds being harder to spot and showing a duller color in relation to the male bird. The cardinal was in competition for its title with 10 other birds including the robin, the tufted titmouse and the bluebird but led those birds by more than 11,000 votes. Clay County is home to another of our state symbols, the golden delicious apple, which was developed in 1912 by Anderson Mullins of Porter Creek. Since 1972, apples, in general, were the state fruit until lawmakers specified that the yellow-freckled apple is West Virginia’s official state fruit during a legislative session in 1995. Meanwhile, yellow is not only the color of the state fruit but is one of the two colors that were deemed symbols of West Virginia by Senate Concurrent Resolution 20 in 1963. The resolution declared old gold and blue to be the official colors of the state during the state’s centennial year, a fitting 100th birthday present. West Virginia’s sportsmen selected the official state fish. A native West Virginia species, the brook trout, was almost unanimously voted during a poll conducted by the Division of Natural Resources (DNR). This trout is one of the most popular North American game fish, easily recognizable with its vibrant colors and known for being feisty in nature, perhaps mirroring the freedom loving Mountaineer spirit. Under House Concurrent Resolution 6 in 1973, the Legislature selected the brook trout over smallmouth bass, largemouth bass, musky and bluegill, the other choices in the DNR poll. Although some residents of the state have not seen a black bear in the wild, it has been recognized as the state animal since March 6, 1973, following the results of a poll conducted by the DNR among teachers, students and sportsmen. The only species of bear native to West Virginia, black bear are most commonly found in the mountainous southeastern regions of the state. During the 2004 legislative session, September 12 was proclaimed Monarch Butterfly Day. This is a day to commemorate and preserve the butterfly of the state, which was declared in March 1995 by Senate Concurrent Resolution 11. This butterfly is only seen in the state during certain parts of the year because these colorful insects follow annual migration patterns from the Mountain State to Mexico and back again. One of the most unique (some might say bizarre) symbols is our state soil, Monongahela silt loam. West Virginia is one of only 19 states to have adopted an official soil. Senate Concurrent Resolution 5 was passed in 1997 after concerns for soil resources were rising in the United States. West Virginia has more than 100,000 acres of Monongahela silt loam, making it an easy choice as the official native soil of the state. The most recent addition to the state’s menagerie of symbols is the honeybee. After many hours of debate, the honeybee was adopted, over the lady beetle, as the official state insect in 2002 by the Senate Concurrent Resolution 9. These symbols provide the state’s residents with a distinctive bond and a way to identify with the region. They help distinguish the state of West Virginia and are a definitive source of pride for its citizens. Regardless of the research, lobbying and polls that lead to the adoption of symbolic representations of West Virginia, the symbols themselves stand as historic icons that help define the Mountain State. Senate Bill 139 will allow a circuit court or family court judge to deny a name change petition in certain cases. The judge will be able to deny the petition if the person is trying to change his or her name to avoid identification or arrest by any local, state or federal law enforcement. The judge must also find that all required information for the petition is correct before ordering the name change. Senate Bill 205 will update current domestic violence protective orders to protect an individual who has filed a complaint against, among other things, threatening e-mails, phone calls and voice mails. Senate Bill 360 relates to extending the time a local levying body may meet as a levying body. When a levy is placed on the ballot for consideration during a primary election, each local levying body may extend its time to meet as a levying body until June 1st of that year. House Bill 2141 will raise the age at which a person may request to be excused from jury duty (due to age) from 65 to 70. These bills now will go to the Governor for his consideration. House Bill 2126 would exempt land-based finfish aquaculture facilities from certain sludge management requirements such as waste disposal. House Bill 2498 would enhance the penalty for indecent exposure to a child under the age of 14. Any person who intentionally exposes himself or herself to someone under 14 years old for the purpose of sexual gratification could be convicted of a misdemeanor and would be fined up to $500 or sent to jail for up to a year. A second offense would make the person, if convicted, guilty of a misdemeanor and would be fined up to $1,000 and sent to jail for 30 days to 12 months. For a third and subsequent offense, the person would be guilty of a felony and would be fined up to $3,000 and imprisoned for one to five years. House Bill 2578 would continue current mental health laws for group insurance plans that were set to end this March. House Bill 2585 relates to the renewal of teaching certificates and permanent certification. Until a person qualifies for a certificate, any professional or first class certificate based on a bachelor’s degree could be renewed if it’s within five years from the date the certificate became valid. House Bill 2781 relates to modifying the permitted length of school buses so that they may not exceed 13 feet, six inches. House Bill 2787 would allow cooperation with the Secretary of State’s office in providing that victims of domestic abuse, sexual assault, or stalking are given a substitute mailing address. This bill would provide extra protection for the victim because the victim’s address would be kept private and not available to possible offenders. House Bill 2789 would make available the expertise of former magistrate court clerks when current clerks are unavailable or their positions are otherwise vacant. This bill would also set stipulations for the compensation of their services. House Bill 2791 would eliminate the jail penalty for violating a peace bond, which seeks to ensure good behavior. However, if the defendant violates the conditions of the bond, he or she may be fined $250. House Bill 2204 would allow a retiring police officer to keep his or her revolver. Circumstances for retirement include termination given by the Chief of Police, 25 years of honorable service, or if the officer becomes disabled or mentally incompetent. House Bill 2380 would add a new section to current law on the consumer sales and service tax, which would exempt the purchase of certain drugs, durable medical goods such as wheelchairs, mobility enhancing equipment and prosthetic devices from the consumers sales and service tax. These purchases are made through a health care provider, which is any person licensed to prescribe drugs intended for use in the diagnosis, cure, mitigation, treatment, or prevention of injury or disease in humans and any hospital, medical clinic or nursing home. These purchases are prescribed and used in the diagnosis, cure, mitigation, treatment, or prevention of injury or disease. House Bill 2801, known as the “West Virginia Fire and EMS Survivor Benefit Act,” would provide a $50,000 death benefit to the families of both paid and volunteer firefighters and EMS personnel who are killed in the line of duty. Individuals who are both fire fighters and EMS personnel are eligible for only one death benefit payment. This benefit incorporates travel, which would include riding upon any apparatus owned or used by the fire or EMS department, or any other vehicle going to or directly returning from any place where the personnel had been participating in a work related action. House Bill 2917 would eliminate the requirement in the Consumers Sales and Service Tax and the Personal Income Tax that requires the accelerated payment of those taxes in June. This bill explains that on and after June 1, 2007 the payment requirement for taxes due on or before June 20th would be no longer effective. House Bill 2989 relates to certain tax shelters used to avoid paying state income taxes. This bill clarifies when penalties would be imposed, determines when the tax shelter registration numbers could be filed with the tax commissioner and determines when tax shelter investor lists could be filed with the tax commissioner. House Bill 2990 would make technical corrections to assure the proper collection of offset fees. The Tax Commissioner would be responsible for the collection of taxes, tax additions, penalties and interest. House Bill 2991 would authorize the Tax Commissioner to conduct criminal record checks for prospective employees of the Tax Division. This would be conducted to determine if an applicant for employment in the state tax division is suitable. Criminal records checks would be administered through the Criminal Identification Bureau of the West Virginia State Police and a national criminal history check through the Federal Bureau of Investigation. The results of any criminal records or criminal history would be sent to the commissioner, who only could disclose that information if it is directly related to employment. House Bill 2992 would decrease the health care provider tax imposed on gross receipts, which are the amounts received from patients, third-party payers or others, for nursing facility services. The nursing home provider tax would be decreased to five and one-half percent of the total gross receipts received by November 1, 2007. House Bill 2349 relates to the continuation of the Board of Registration for Sanitarians. This would be in effect until July 1, 2016. House Bill 2574 would extend the term of the Board of Social Work Examiners. This would go into effect until July 1, 2017. House Bill 2586 relates to the continuation of the Board of Veterinary Medicine. This would go into effect until July 1, 2017. House Bill 2587 relates to the continuation of the Board of Optometry. This would go into effect until July 1, 2018. House Bill 2800 would regulate the practice of Radiologist Assistants and govern the practice of medical imaging and radiation therapy. The West Virginia Medical Imaging and Radiation Therapy Technology Board of Examiners would be in effect until July 1, 2010. Senate Bill 6 would authorize boat safety checks by conservation officers. An officer would only be able to board the boat with the permission of the owner or operator or on the belief that a criminal activity is occurring on board. Senate Bill 168 would allow consumer lenders to sell home and automobile membership plans to their customers. The purchase of the plan must be optional and cannot be a condition for the granting of a loan. The bill defines a home or automobile membership plan as including health coverage, property coverage, home security services, prepaid legal services and any other insurance services or benefits related to ownership of a home or automobile. Senate Bill 178 would allow counties to increase their hotel occupancy tax. Currently, county commissions may assess up to a 3 percent hotel tax. This would increase the maximum tax to 6 percent. However, a public hearing would have to be held at least 10 days before the commission votes to increase the rate. The bill would also expand the possible uses for revenue created by the hotel tax; these new expenditures would include providing incentives for passenger air service within the state and providing emergency medical transport in certain areas. Senate Bill 197 would remove any criminal or civil liability for individuals who are defending their home or automobile. If a person uses reasonable force to repel an intruder, he or she would not be liable for any injuries to that intruder. The bill does not provide such immunity for the use of booby traps, such as spring-guns. Senate Bill 389 would define blue catfish as a game fish. The blue catfish is a species native to the Kanawha and Ohio rivers that the Department of Natural Resources is studying. By defining it as game, the bill would allow the state to regulate the fishing of this species. Senate Bill 396 would authorize the Director of the Division of Natural Resources to exempt certain information from disclosure under the Freedom of Information Act. Specifically, site-specific data on certain rare plant or animal species and their habitats could be kept confidential as a way to protect the viability or existence of the species. Senate Bill 398 would allow the Division of Motor Vehicles (DMV) to suspend or refuse to register vehicles of certain interstate motor carriers (i.e., large trucks and buses). The DMV would be able to do so if a motor carrier fails to provide a federal motor carrier identification number (USDOT number) or if the carrier’s authority to operate in interstate commerce has been suspended by the Federal Motor Carrier Safety Administration. Senate Bill 405 would remove the requirement that a direct deposit authorization form or state employees go to both the state auditor and the treasurer. Instead, the bill would require only the auditor to approve the form. The bill also would allow the auditor to provide electronic notification of direct deposit transfers. However, an employee may opt out of the program and continue to receive written notification. Senate Bill 428 would establish identity theft protections for consumers. Specifically, an individual would be allowed to place a security freeze on his or her credit report. Consumer reporting agencies would then be prohibited from providing that individual’s credit report without the person’s consent. These agencies would be allowed to charge up to a $5 fee for placing, removing or temporarily lifting the freeze. Even with a freeze in place, certain government agencies would still be allowed access to the credit report without consent (e.g., for the purposes of tax or child support enforcement). Senate Bill 431 would regulate the use of agricultural lime, a common soil additive. The bill would bring the state code in line with standards set by the Association of Official Analytical Chemists International. Senate Bill 542 would authorize the rule made by the Higher Education Policy Commission relating to West Virginia Higher Education Grant Program. The bill would also authorize the rule related to the Workforce Development Initiative Program made by the Council for Community and Technical College Education. 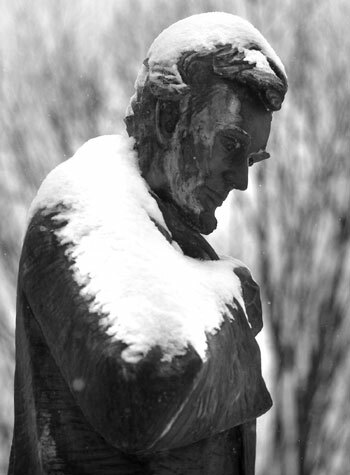 “It is portentous, and a thing of state, that here at midnight, in our little town, A mourning figure walks, and will not rest, near the old court-house pacing up and down,” from the poem “Abraham Lincoln Walks at Midnight” by Vachel Lindsay on which the statue outside our Capitol is based. On April 20, 1863, President Lincoln issued a proclamation through which, 60 days later, West Virginia would become a state, the only state born out of the armed conflict of the Civil War.